Hello, I’m 25 yrs. Old and I am interested in opening a "daycare" but I want to know if I need to go to school for this? If so what classes would I have to take? I’ve taken care of babies and toddlers before. Now I’m think about taking the time to open up a daycare and take care of children besides family and friends. If you can help me out I’d be very grateful. I also looked at your qualification page I believe I am a good fit. In Home Child Care Business. A Quick Start Guide! 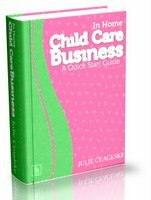 This Illinois publication outlines your necessary steps for starting a child care business in your home. They will inform and assist you on the requirements, classes you may need, regulations, etc. Thank you for your question and hope that you will keep us posted on your decision!